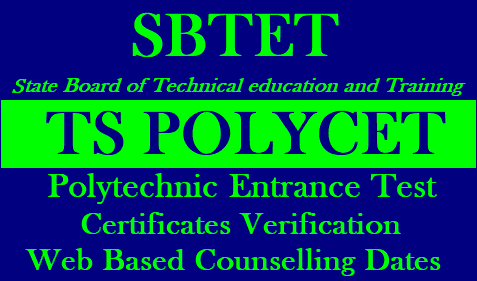 TS POLYCET 2019 Admissions, Certificates Verification for Web Based Counseling Dates-TS Polycet Web options : SBTET, "POLYCET" will be conducting every year by Telangana State for the candidates seeking admission into all diploma courses in Engineering/Technology offered at Polytechnics/Instiutions (including Aided and Unaided Private Polytechnics/Institutions running as 2nd  shift in Pvt.Engineering colleges) in Telangana State for the academic year 2019-2020. The SBTET,Telangana issused the POLYCET notification in the month of march,2019 online application start from ...March,2019 to ..April,2019 Eligible candidates can apply.Every year TS POLYCET was conducted successfully, this year TS POLYCET will conducted successfully on .. April,2019 by 11 AM to 1 PM in all the Districts  of Telangana and the results of TS POLYCET has bee released on ..April,2019 by the SBTET Telangana. The candidates who have qualified in TS POLYCET 2019 have to attend for certificate Verification in first and final phase counselling and desire of seeking admission into Diploma courses offered in Government/Aided Polytechnics will informed the web options can be exercised as per schedule given below.The candidates who are attended the first and final phase of counselling can use their old password,Login ID,for leftover seats available and consequential vacancies that may arise in the process of allotment as per the schedule given below.it is advised to excercise options for interested Polytechnics assuming vacancies are available in the course of their choice. Qualified Candidates of POLYCET have to submit their information and they have to pay fee through Online. 2. Enter Hall Ticket number,Password,Date of Birth and ICR Form Number Candidate Login. The qualified candidates of TS POLYCET 2019 are informed that the admission into polytechnics will conducted in  the month of May..,2019.The detail information and other instructions about counselling can had from Helpline centers on the day of verification and it is also available in  https://polycetts.nic.in. ; and the classes will commence from 9th june 2019.Further detailed notification with regard to web counselling for admission to various diploma courses shall be released by the director of technical education,Telangana. 4.Hall-Ticket in respect of TOSS/APOSS/ICSE/CBSE/NIOS candidates. 7.Income Certificate issued on or after 01-01-2019 by competent authority if applicable. 8.Caste Certificate issued by competent authority. 9.In respect of Non-Local Candidates to consider them for allotment under unreserved seats the following certificates needs to be submitted. a) Residence Certificate: Candidate who has resided in the state for a total period 10years excluding periods of study outside the State;or either of whose parents have resided in the state for a total period of 10 years excluding periods of employment outside the state. b) Employer Certificate: Candidates who are children of parents who are in the employment of the State or Central Government,Public Sector Corporations,Local bodies,Universities and other similar Quasi Public Institutions within the State at the time of applying for TSPOLYCET-2019 Examination. The Candidates of SC/ST category have to pay Rs.300/-While OC/BC/Minority Candidates have to pay RS.600/-towards processing Fee.Tution fee payable after allotment varies between 3,800 to 21,000 per annum depending on type of college allotted.The reimbursement of Tuition fee in respect all eligible candidates will be issued by the Government of Telangana and Andhra Pradesh states from time to time.However, all the candidates have to pay towards TS-SBTET recognition fee as prescribed. Note: In respect of PH Category,Candidates have to produce a certificate issued by the District Medical Board.Candidates who have disability of 40 % and above will only be considered under PH category. CAP category candidates have to produce a certificate issued by Zilla sainik Welfare Officer(In case of Ex Service Men),Identity card and Discharge` Book for verification.Candidates whose parents are domicile of Telangana state only eligible Under "CAP" Category. AngloIndian Candidates have to produce a certificate issued by Competent Authority of their place of residence.